Before diving into any price analysis of Bitcoin, its worth covering some of the recent events in cryptoland, so that we can catch everyone up to speed. 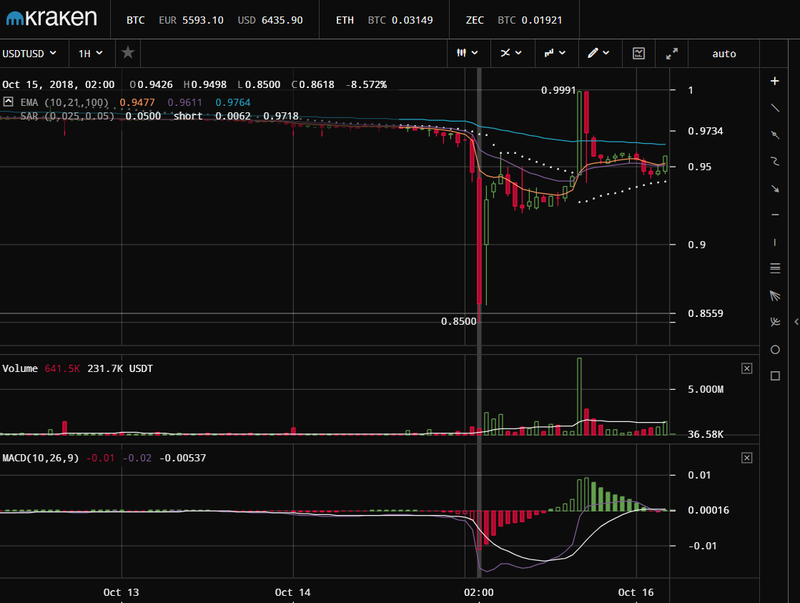 So, in the picture above, this is what the spread was on October 10th. At this point, the difference in prices had grown to the extent to where it was noticeable and worth tracking. This was the day where it seemed as though ‘all hell was breaking loose’. This resulted in massive discrepancies in the premiums on various exchanges across the cryptosphere. At one point, the premium on Bitfinex had exceeded 10%. Rather than crashing the price of Bitcoin as many have intuitively predicted would happen in such a situation (obviou panic, Tether breaking, the stuff of movies), the price of Bitcoin actually shot up that day. In the picture above, we can see the price of Bitcoin shoot up from a low of $6.2k all the way to a high of $6.8k. Please keep in mind, this is the Coinbase chart and Coinbase only uses fiat dollars on its platform and no other synthetic dollar derivative. Therefore, this increase in price cannot be attributed to a growing premium on exchanges. So, what was the cause of all of this? One reason for the spike could be due to arbitrage. As the peg on Tether began to ‘break’ (i.e., the price of Tether tokens not being valued at 99 cents/$1/$1.01), the price of Bitcoin on Tethered exchanges started to increase significantly. For those that believed that the drop in Tether was merely incidental and not indicative of a larger systemic issue with the stablecoin, this was a beautiful opportunity for arbitrage. This is because, on fiat-based exchanges like Kraken and Coinbase where the price of Bitcoin was not directly affected by the disruption in Tether parity, Bitcoin’s price would’ve been 10% cheaper than what one could have purchased it for on another exchange. Therefore, if one were to hypothetically have bought Bitcoin for $6.3k on Coinbase, they could have then sold that same Bitcoin for 7000+ Tether tokens on Bitfinex’s exchange. And, assuming that parity would eventually be reached again, this would present a very lucrative and immediate +10% gain for any and all individuals that made this move. Now, more than likely, this type of arbitrage was facilitated primarily by bots and not actual human beings making the trading decisions. Of course, there may have been some human beings, but the algorithmic programs that are deployed by traders that operate on these exchanges are able to automatically detect when there are discrepancies in the price and then trade accordingly. These bots, of course, are not programmed to understand that the arbitrage opportunity is only due to the fact that Bitfinex’s premium and the premium on other Tether-based exchanges had skyrocketed. So, these bots are simply maneuvering how they would in any other arbitrage situation. Almost every single one of the sites and apps that traders use to check the price of Bitcoin and other cryptocurrencies provides the price by extracting API data from multiple exchanges, then averaging it out. Thus, when the premium grew on Bitfinex and other Tethered exchanges, so did the average price of Bitcoin and other assets on these price tracking sites and apps. Traders that were not aware of the situation more than likely saw this and took this as a sign that the market was rising, which also spurred artificial bullish behavior. In addition, there were no formal announcements made by any of these apps that took any of this into account.